Figuring out what to wear when it’s too hot for clothes can be a tall order, but a suitably stocked wardrobe can go a long way towards maintaining at least a veneer of cool. Even when you’re one degree away from spontaneously combusting on the morning commute, a carefully curated selection of summer garments will take some of the heat off, both literally and figuratively. But it isn’t just the ‘not bursting into flames’ department where having the right high summer clothing to hand can help; you’ll also reduce your morning outfit decision-making time, thus buying precious extra minutes in bed, berating yourself for not getting up earlier and going to the gym. So, what should you have in your peak heat rotation? We tapped nine style experts for their definitive suggestions. Ah, the humble T-shirt. 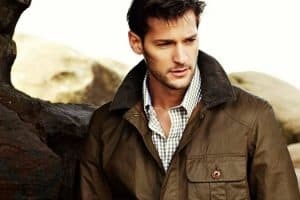 If there’s a piece of men’s clothing out there more versatile, stylish, practical and timeless, we want to know about it. A crisp, well-fitted example in white is the well-dressed man’s bread and butter, an essential component in any seasonal wardrobe. “The definition of a high summer essential – a classic white T-shirt is the sartorial foundation on which to build any look,” says London-based menswear designer Oliver Spencer. The trick to exploiting this key summer item to its full potential is all in how you choose to wear it. “Throw one on under an unbuttoned shirt with a pair of loose-fitting shorts for a casual, breezy look or smarten it up by tucking into a pair of tailored linen trousers,” adds Spencer. Add an unstructured sports jacket over the top, and you’re all set for a long evening of al fresco summer dining. As far as summer wardrobe staples go, chino shorts are up there with the best of them. This warm-weather must-have finds itself at home in both a beer garden and on the terrace of a swanky Spanish beach club. Its versatility knows no bounds. “The chino short is a wardrobe essential and comes in a variety of shades to suit many high summer occasions,” says Marks & Spencer head of menswear design James Doidge. When a shirt is a bit too much, but a T-shirt just isn’t quite enough, the polo shirt has got your back. And opting for one in a less traditional fabric is the perfect way to bring this classic piece up to date and give an outfit a contemporary twist. “A polo shirt is one of the most classic items a man can own and works for guys of all ages,” says Damien Paul, head of menswear at MatchesFashion. “Recently the staple has been updated in terry-towelling, which softens the silhouette and feels holiday-appropriate.” It earns bonus points for keeping any unfortunate sweat patches at bay too, a quality that’s worth its weight in gold on a date. The menswear world hasn’t been able to move for Cuban collar shirts over the last couple of summers, and you know what? We’re okay with that. As far as we’re concerned, this breezy throwback piece can stick about for as long as it wants and we’ll all continue to channel our inner Tony Montana. “A Cuban collar shirt is the one item every guy needs,” says the design team at etailer BoohooMAN. “Whether bold and bright or neutral, a floral or paisley print will cover your style needs throughout the day, on holiday or at home.” In other words, it’s versatile, and it makes you look like Al Pacino fresh out of the 1980s. What more could you possibly want? Traditionally, when it comes to swimwear, menfolk have always had two distinct options. We could either play it safe and slap on a pair of shorts (like a regular, non-model kind of person) or choose to parade around the pool in a pair of budgie-smugglers, terrifying fellow holidaymakers. However, times are changing and so are our options, thankfully. To take your swim shorts game up a gear, Tarling, who has dressed the likes of Tom Hardy, suggests forgoing regular shorts or trunks and checking out some tailored styles instead. “In order to get the best cost-per-wear (or swim) go for a tailored cut in a neutral block colour so they can easily double up as normal shorts.” This way, you can make a seamless transition from beach to bar, without even having to put on any underpants. That’s called living the dream. At its core, dressing for high summer is all about balancing comfort, ease, style and simplicity. That might sound like a tall order, but luckily loafers are the embodiment of all four elements, making them the perfect accompaniment to the rest of your warm-weather wardrobe. As the autumn and winter months practically demand leather shoes – because, you know, weather – use summer as an opportunity to break out more tactile suede versions that add a welcomed air of relaxation to proceedings. Avoid the dreaded sweaty undercarriage during the high summer months by casting off heavy, dark denim in favour of some lighter, airier and more heatwave-friendly legwear. We’re talking, of course, about linen. The fabric can be a tricky territory to navigate without coming across all oil tycoon on a yacht, which is why it’s best to opt for a cotton-blend. The minimalist white sneaker is to modern men what wingtips were to those that went before. In other words, it’s a wardrobe essential and a surefire style classic of tomorrow. If you don’t already have a pair or two in your rotation, there’s no better time to join the party. Where possible, aim for styles with as few design details as possible to ensure they bookend a suit just as easily as they do a pair of shorts. Baring flesh is the easiest way to cool off in the heat, but picking which body parts to set free is the key to remaining stylish (and off any kind of police register). With plenty of blood vessels near the surface of the skin, ankles are a great temperature regulation device. However, going sockless doesn’t mean you shouldn’t wear any socks at all. “Invisible socks are a great way to avoid sweaty feet, give some extra grip and keep blisters at bay when wearing shoes this summer,” says stylist Alex Longmore.